You are here: Home / Ethnic Groups / The People of Sulawesi / Who are the Wolio? The Wolio, also known as the Bau-bau, Buton or Butung, primarily live on the island of Buton, around the city of Bau-bau. Their ancestors were immigrants from Johor, Malaysia at the beginning of the 15th century. They also founded the Buton dynasty. In 1540, the sixth king became Muslim. He reshaped the kingdom to become a sultanate, and set himself up as the first sultan. 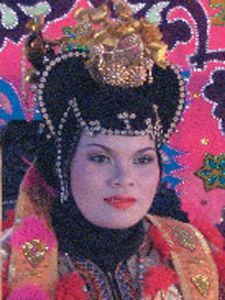 The sultanate of Buton lasted until the death of the last sultan in 1960. With his death, the Buton sultanate ended its formal reign, though its influence is still felt throughout all of the islands in the region. The Wolio are at the heart of the Butonese culture. They speak the Wolio language. It is part of the Wotu-Wolio language cluster, which also includes Kalao, Kamaru, and Wotu. Arabic is also understood by some, and its script is used in religious writings and older written materials in Wolio. Each Wolio village has a market for selling cloth products, such as silk and cotton. Many villages also have small stores. Peddlers also can be seen selling their wares throughout the village. Wolio people are farmers. Primary land crops are rice, corn and cassava. In the sea, especially from June to September, they cultivate agar-agar (seaweed) from vast stretches of water. It is then ground up and used to make a variety of products. Many people also work as sailors and shipbuilders. The water around Buton and Muna is filled with fish, especially tuna and those found around coral. Wolio houses are built using boards, with small windows. Roofs are small boards and coconut leaves. They are raised up to two meters above the ground. In the Wolio community, the men are mainly involved in labor outside the home, while the wife works in the home and manages the family and their finances. Buton is known for its production of asphalt and is currently being explored for oil and other minerals. Many people have moved to other islands to find work. At present, some Wolio people live in Maluku and Papua. Bau-bau has now achieved official city status with its own mayor and local government. This has created many opportunities for Bau-bau’s continued development. The Wolio people highly value education. Good education for their children is a high priority. This, added to their willingness to study foreign languages, has resulted in noticeable social advancement. Almost all Wolio have beliefs centered in Sufi Islam. According to their teachings, they practice mediation in order to receive visions from God, or to find hidden truths far beyond their own reasoning. Belief in reincarnation is also adhered to as a result of Hindu influence. They also believe that evil spirits cause illnesses while helpful spirits give guidance. The Wolio need greater opportunities for work that can provide enough money for their livelihood. The Wolio people live on a major sea lane through Indonesia. As a result, there is great tourism potential for the city. Their fishermen need better training and more knowledge to improve production and distribution of their sea products. In addition, teachers, and educators are needed to satisfy the Wolio people’s thirst for knowledge, and to develop their potential.